Last Sunday, Nigel Slater published two ‘pie’ recipes in the Guardian. Neither is a pie in the ‘topped with pastry’ sense, but we’ll allow him some latitude. His Cauliflower and Rosemary Tart caught my eye, because it would make use of the cauliflower in the fridge. I keep buying cauliflowers, with the intention of making wartime Woolton Pie, but I never get around to it. The last one went into cauliflower cheese (yum! ), but maybe this one could have a more exciting fate? We had all of the ingredients for the cheesy pastry in stock – plain flour, butter, pecorino and an egg yolk. The filling would take a little bit more ingenuity. We had 1 cauliflower instead of 2, 1 sprig of rosemary instead of 6 (my plant is little! ), and leftover coconut cream instead of the cow’s cream I can’t have. The largest problem was Nigel’s comment that I would “also need a 22cm diameter tart tin with a removable base”. We don’t have one of those. So I went on a baking tray hunt, and discovered that we had a pair of 16x16cm disposable aluminium trays, which I’d washed and stashed away for reuse. It made sense to make two pies, rather than one big one, since there are two of us and the original recipe serves 6. So that is what we did. The recipe is a bit involved – you have to separate the cauliflower florets, chop the stems and then roast those separately, and make the pastry, and then there’s blind baking involved, but ultimately it’s worth it. Because we only had one cauliflower, I added some broccoli stem from the fridge to the cauliflower stem, and that worked fine. Nigel forgets to mention that you blitz the stems with the cream to make the bottom layer of the filling, but it’s pretty obvious that’s what you do. Ours turned out a little runny (not enough stems), so I thickened it with breadcrumbs from the freezer, and threw in the leftover egg white, and that worked really well. You could add in leftover cooked vegetables, or potatoes, instead. The cheesy pastry is to die for, and the rosemary shines through (even if you only have 1 sprig!) and we thought the tart would make a lovely lunch we could serve to guests, if we ever had any. It was that nice, and something very different. It was special enough for Sunday lunch, especially as eating half a tart meant we didn’t need to eat for the rest of the day…. I had intended to bake one of the tarts, and then bake the second the next day, but I forgot and put them both in the oven. It didn’t matter – the cooked tart reheated nicely in the oven for about 20 minutes, and made a lovely weeknight supper. 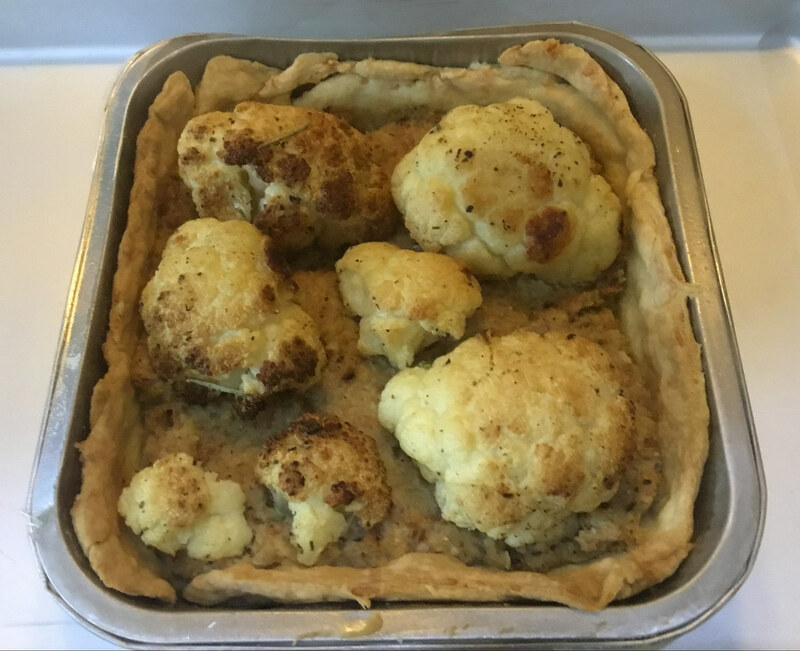 A delightful vegetarian tart, which gets ‘no waste’ points for using the cauliflower stems and leaves, and which can easily get a food waste makeover by swallowing odds and ends from the fridge/freezer. Nigel gets full marks for this one! Wild Food expert Roger Phillips is crowd-funding a book on Wild Cooking with Unbound. It looks like it will be a fun collection of recipes for wild plants, fungi, garden plants and edible flowers, with a section on outdoor cooking. Please help fund the book so I can get my copy quicker!